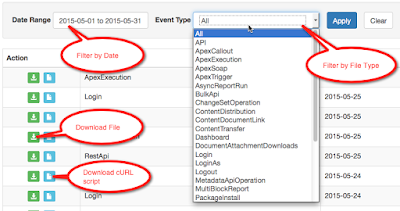 Event Monitoring makes downloading application logs easy using the Salesforce API. But what happens if you don't know how to use the API? Or you don't have an operating system that makes running a download script easy? Or you've never written a download script before? Or you just want a quickly download a newly generated file without messing around with code? 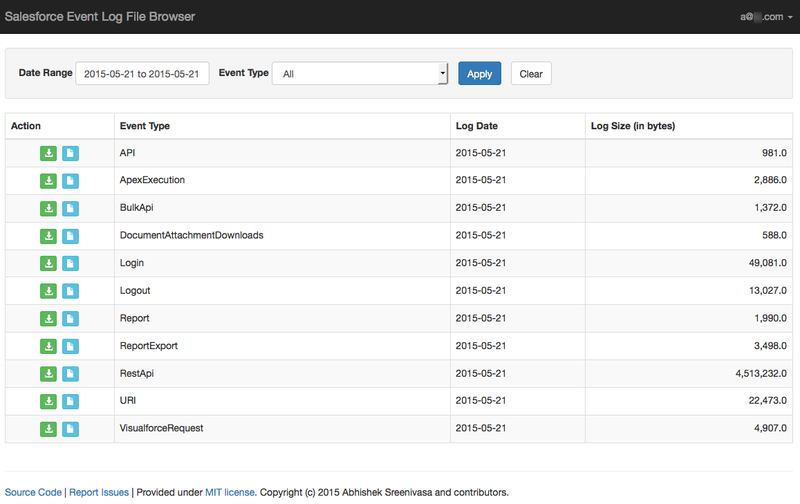 Introducing the Salesforce Event Log File Browser: https://salesforce-elf.herokuapp.com/. This browser based app, built by Abhishek Sreenivasa and the platform monitoring team, uses Ruby on Rails and is hosted on Heroku. 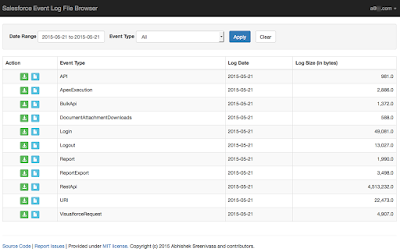 It's designed to enable administrators or developers, who just want to focus on the log data, to easily download an Event Log File without writing any code or setting up any integrations. This makes it perfect for both trying out Event Monitoring as well as getting started downloading log files. The app is designed to be very simple. After logging into your production or sandbox organization using OAuth, you are presented a list of downloadable files. Because you may have up to thirty days of files, you can filter on both the date range and the file type to find specific files that you want to download. You can choose to either download the file by selecting the green download action icon or you can get a jump start on a simple cURL script by selecting the light blue page action. The latter action was created to help bootstrap the integration effort. For instance, if an integration specialist asks how to create a script to automate the downloads on a daily basis, you could give them this script to help get them started. The code for this app is available publicly on Github. You can log any issues you may encounter directly to this Github repo as well. The app is licensed under MIT licensing terms, so you're free to take the source code and modify it to meet your use case. API first features like Event Monitoring make it easy to create apps that meet a wide set of use cases. 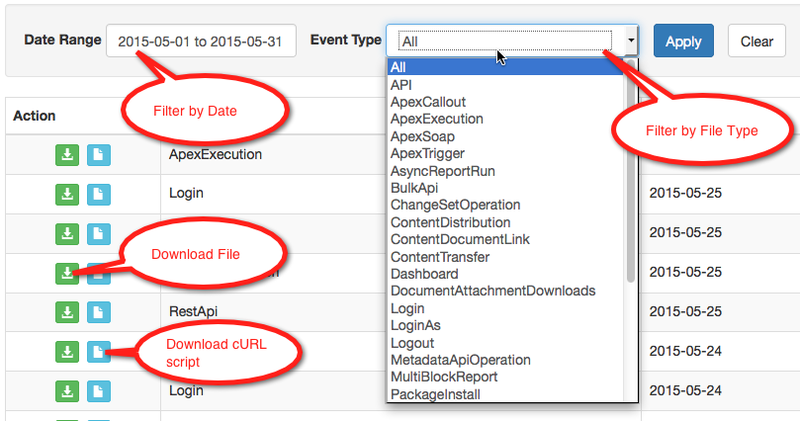 The Salesforce Event Log File Browser app is just one example. While this browser doesn't take the place of an automated download script, it does simplify both the trial experience as well as enable simple downloads of Event Log Files without writing any code or understanding how OAuth works. And because all organizations now have at least login and logout log file types, if not all twenty nine types, anyone should be able to use it. Happy downloading! Normally, when I get on the phone with a customer, they’re familiar with the audit capabilities within Salesforce and we just discuss the Event Monitoring add-on. However, while on the phone the other day with an IT security professional, I realized that we needed to take a step back and review the different options around auditing and monitoring user activity before we could dig into the add-on value of Event Monitoring. This post is designed as a high-level introduction to security monitoring to better understand some of the different options security professionals have to audit data and user actions within their organization. There are many more advanced features that help enable security professionals to audit user behavior and track activity. Salesforce is a trusted cloud service. These solutions help you to trust but verify your user's behaviors.